Lauren Fitzsimons is an associate in Dykema's Lansing office. 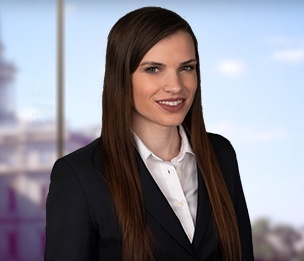 Ms. Fitzsimons's practice focuses primarily on government policy issues in highly regulated industries. While in law school, Ms. Fitzsimons worked as a student attorney and a student supervisor in the University of Michigan Law School's Child Advocacy Clinic and Unemployment Insurance Clinic. Ms. Fitzsimons represented claimants in administrative hearings and drafted an application for leave to appeal to the Michigan Supreme Court. She drafted provisions of a bipartisan eight-bill package that reformed the Michigan Employment Security Act. Ms. Fitzsimons also received a certificate of distinguished service for her role in the bipartisan workgroup that put forth that eight-bill package. Ms. Fitzsimons was also a Contributing Editor of the Michigan Journal of Environmental and Administrative Law. After graduating, Ms. Fitzsimons worked at a law firm in Phoenix doing real estate, liquor licensing, and corporate work. Upon returning to Michigan, Ms. Fitzsimons worked in the Research Division of the Michigan Court of Appeals. Ms. Fitzsimons drafted research reports and proposed opinions for a panel of judges on the Michigan Court of Appeals.